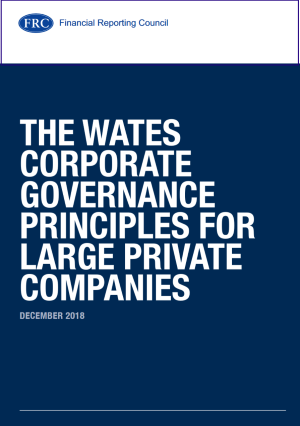 A new code for the corporate governance of large private companies has been launched, the ‘Wates Principles’, named after the Chair James Wates CBE, to provide a framework to help them not only meet legal requirements but to promote long term success in this vital sector. These Principles are part of a number of changes made this year to the UK corporate governance framework. They have been developed by a coalition established by the Financial Reporting Council (FRC) and chaired by James Wates CBE. By explaining the application of these Principles large private companies will be able to meet their obligations under The Companies (Miscellaneous Reporting) Regulations 2018. Purpose and Leadership – An effective board develops and promotes the purpose of a company and ensures that its values, strategy and culture align with that purpose. Board Composition – Effective board composition requires an effective chair and a balance of skills, backgrounds, experience and knowledge, with individual directors having sufficient capacity to make a valuable contribution. The size of a board should be guided by the scale and complexity of the company. Board Responsibilities – The board and individual directors should have a clear understanding of their accountability and responsibilities. The board’s policies and procedures should support effective decision-making and independent challenge. Opportunity and Risk – A board should promote the long-term sustainable success of the company by identifying opportunities to create and preserve value and establishing oversight for the identification and mitigation of risks. Remuneration – A board should promote executive remuneration structures aligned to the long-term sustainable success of a company, taking into account pay and conditions elsewhere in the company. Stakeholder Relationships and Engagement – Directors should foster effective stakeholder relationships aligned to the company’s purpose. The board is responsible for overseeing meaningful engagement with stakeholders, including the workforce, and having regard to their views when taking decisions. Reporting against these principles will take effect on 1 January 2019.